Billy Greer, owner of Jing Ying Institute, is practicing the ceremonial lion dance celebrating the Chinese Lunar New Year. If you think last year was a real beast, a billion Chinese would agree heartily. Expressively, their New Year's greeting is a word play on "year" and "beast." Homophone words, both have similar spellings - nian for beast and nian meaning year - and sound similar in conversation, but evoke vastly different meanings. Billy Greer is the owner of Jing Ying Institute, a martial arts school at 1195 Baltimore Annapolis Blvd. in Arnold. He said the upcoming Chinese New Year celebrations, which begin Feb. 18, stir up memories of old myths, legendary beasts and a desire to say farewell to the previous 12 lunar months. That's why the spectacular Chinese lion dance performed by his family members, instructors and students is so popular in this area. In China, he pointed out nian was a beast that "destroyed crops and ate people, but was afraid of loud noises and the color red. It is a homophone for nian meaning year. Xin nian kuaile means happy new year, a more modern phrase, while Guo Nian Hao is more traditional in northern parts of China and is a congratulation on surviving the beast. The Chinese Year of the Boar officially begins with celebrations continuing through March 4, and will be anything but boring. Starting Feb. 19, the Jing Ying Institute will host a series of free workshops, seminars and events culminating on Feb. 24 at noon with a dramatic lion dance performance followed by demonstrations of Kung Fu forms and weapons. Plus, a free introductory lesson in Kung Fu is offered at 1 p.m. The troop includes Messrs. Greer and head instructor Sean Marshall, Tim Cherry, Spalding High's Jose Vega, and Lane Greer, 15, and Glen Greer, 18, both home-schooled. Mr. Marshall acts as the head musician while the troupe dances, as drums and other noisemakers are central to the dance. The Jing Ying Lion Dancers appear a dozen times a year at events, including the Severna Park July 4th Parade and various centennial festivals - the Cape St. Claire Strawberry Festival, World Tai Chi Day in Quiet Waters Park and Annapolis Harbour Center, the 10th Anniversary of the Maryland-China Business Alliance, the county fair and on multicultural days in local schools. Lane is picky about what her father is wearing when she lion dances with him. "He can't wear more than a T-shirt covering his shoulders," the teen said. "I can't feel his muscles and steady myself if he's got a lot of fabric in that area." Lane leapfrogs onto her father's shoulders and hoists the lion's head high - 12 feet above the ground. In a flash, she's back on the ground. Nearby, 10-year-old Eoin Reilly is learning to lion dance, too. He's balancing his 5-year-old sister, Mariner, on his shoulders and smiling. 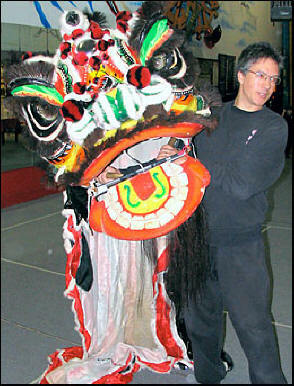 The Chinese lion dance is familiar worldwide, yet ironically, the lion is not native to China, Mr. Greer said. "People heard stories of lions and (how) the emperors sometimes received lions as gifts. They were revered as great creatures with horns and wearing bright colors. The Chinese thought lions were great, fanciful beasts," he said. According to legends, one year they asked the Lion God to rescue them from Nian. He came and saved them. The next two years, the Lion God didn't come. So, villagers made a giant lion head and scared Nian off themselves. Mr. Greer said the Chinese believe evil spirits travel in straight lines. Lion dancers, to sidestep evil spirits, dance in zigzag patterns and "fanciful, intricate steps. Gongs and drums add to their fierceness and ability to scare away Nian. Plus, all the noise and color brings good luck for the coming year." The lion dancing practiced in Southern China, Mr. Greer said, "is more symbolic and performed at important functions or celebrations the opening of businesses." Lion dancers also appear at the dedication of temples, at weddings, planting and harvest times and other festive occasions to help ensure good luck. "Dancing under the costume," he said, "requires quick, powerful moves and strong stances and is usually performed by advanced kung fu students." The Southern Lion's head more closely resembles a Chinese dragon, minus a long snout or horns. Jing Ying's lion dance costume arrived at the school mysteriously in the fall of 1999. The school was known as East-West then and under different ownership. Jing Ying's Mr. Marshall was employed at East-West then and arrived to find a large box on the doorstep. "The Unabomber was fresh in my mind and I was a little nervous about opening it," Mr. Marshall admitted. "When I did, I found the costume inside and a note signed 'Anonymous' thanking us for our work with kids. Lion costumes cost over $1,000 and this was a complete gift. "I later found out who sent it, but I'll keep their secret," the wiry instructor smiled. The school now has two lion costumes - the adult version and a newer pint-sized version for grade-school kids to train with. "We offer lion dancing here to include the culture and traditions of Chinese martial arts," Mr. Greer said. For more information about the schedule of public events at Jing Ying during its Chinese New Year celebration week, or to register for a seat, visit the Web site at www.JingYing.org or call 410-431-5200. Published February 12, 2007, The Capital, Annapolis, Md.